Acer Spin 5 (SP513-52) aims to be the ultimate business ultrabook. It has a sleek design, touchscreen display and of course – it’s a convertible (hence the name)… Hey, who doesn’t like convertibles?! It definitely has a compelling hardware in the face of the fresh out of the oven Intel Core i7-8550U, and a hefty battery, which promises a lot of screen on time (Acer says up to 12 hours but we’ll check that). Not last on our list is the Active Stylus technology with the Windows Ink support. 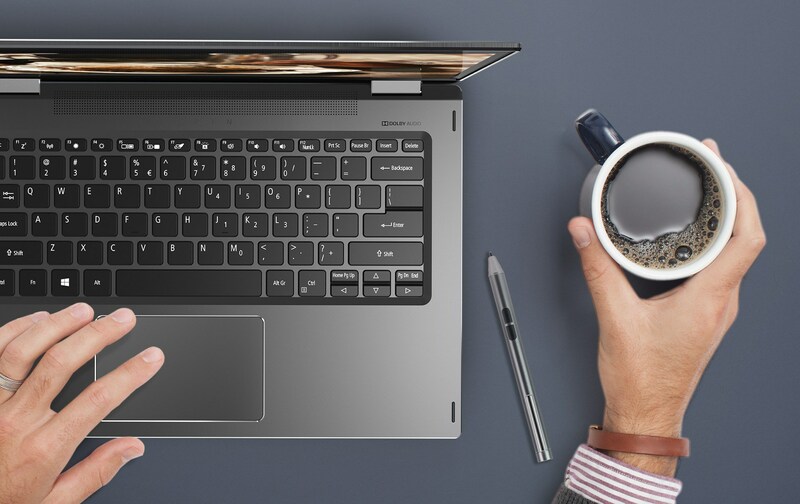 Belonging to the Spin series of devices, the Spin 5 (SP513-52) is perfect to use as a presentation tool. Its small, lightweight and stylish design make it the perfect choice for a traveling businessman or even artsy people. Acer Spin 5 (SP513-52) comes in a nice black box. The insides of this box are divided into two compartments. On the right, we have the charging adapter, and on the left is the device itself. Along with the manuals, Acer has put a stylus to accompany the Spin 5. Additionally, the notebook is neatly pouched in a white antistatic bag and has some cardboard pieces around it for protection against falls or Atomic blasts. We like how more and more manufacturers these days include a stylus device inside their package instead of putting an “Apple” logo and stating that they have it, but you have to buy it separately. It’s really intriguing how with every new model, the business line devices look sleeker, sturdy, and premium. Here Acer has not aimed at making the Spin 5 ultralight. Instead, they’ve decided to give some weight to it /at 1.5 kg (3.3 lbs)/, and make it more durable using all aluminum design, which is a pleasant improvement over its predecessor – the Spin 5 (SP513-51). It also has a slimmer form factor at 324 x 226 x 15.9 mm (12.76″ x 8.90″ x 0.63″). The 15.9 mm thickness and weight of 1.5 kilos create a feeling of some sturdiness, and we find the all aluminum design very appealing to the eye. The most notable feature of this device is the ability to flip its display without breaking in two like Titanic. Furthermore, the hinges seem of a very good quality, and although you can almost open the lid singlehandedly, they can stand the weight of the device in any form, and provide an effortless transition from one state to another. Something we found kind of strange until we got used to the device is that when closing the lid, it feels like its going to slap hard on the bottom part, and this is because there are two magnets at the top of the screen that ensure the closing of the lid. It gave us one or two “Oh sh*t” moments in the beginning. On the way of discussing input devices, we can’t skip the touchscreen. 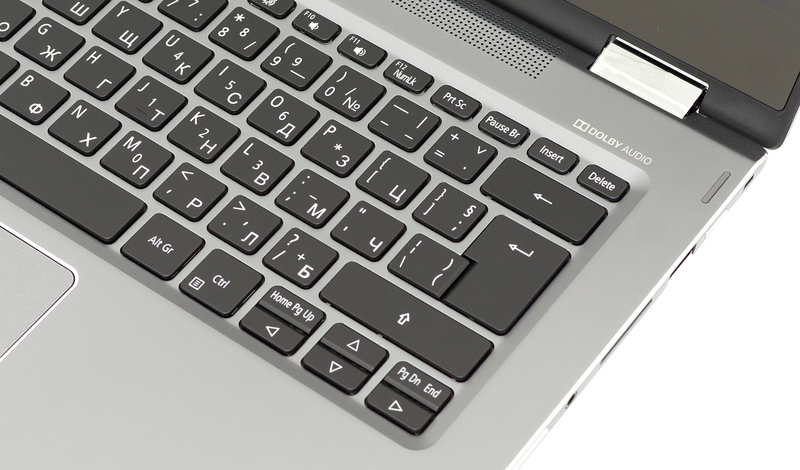 It is utterly precise and combined with the Core i7-8550U it gives a truly remarkable experience. The last thing we can see here is the speaker grills, located just above the keyboard. 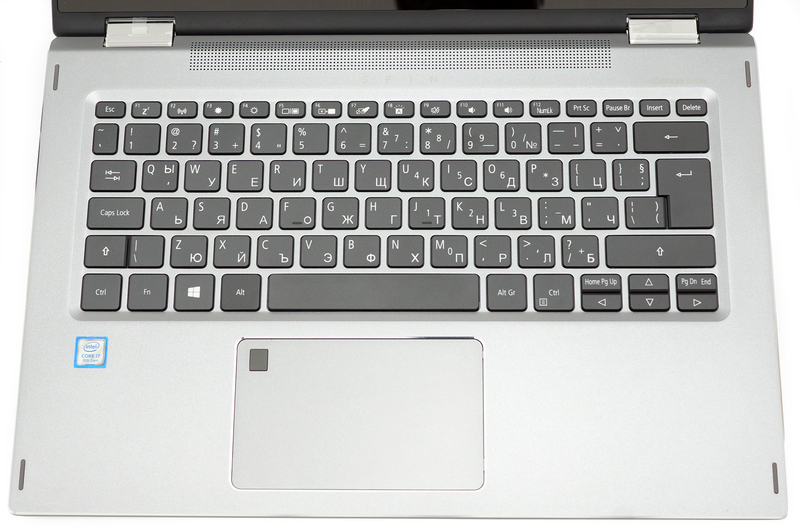 Also, the Spin 5 (SP513-52) has a few rubber legs here, and the keyboard is laid a little bit lower in the interior. All that aims at more convenient experience when using the device in tablet mode. Next on the list are the sides of the device, the left one being completely dedicated to ports. We see a pair of full-sized USB 3.0 ports, an also full-sized HDMI port, and in between there is a single USB Type-C connector, which in addition to data transfer can be used as a charging port with a proper charging adapter. Speaking of supplying power, here we can find and the conventional power input jack. On the other side of the Spin 5, we can see one more, however slower (2.0), USB Type-A port, as well as an SD card reader. In addition to them, we have the undying 3.5 mm jack. In accordance with the convertible form factor of the device, Acer has put the On/Off switch on the side, as well as a volume rocker, so you won’t need to flip the device if you want to switch it off. 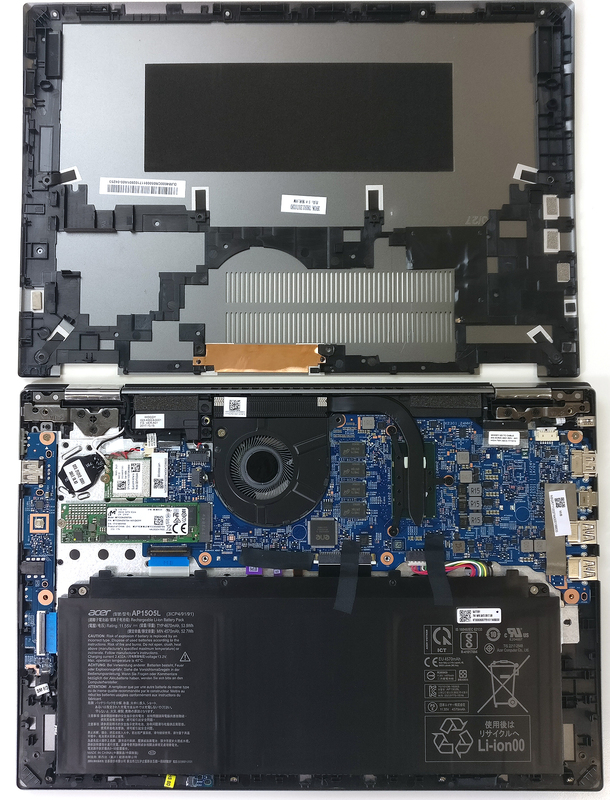 The cooling of the 15.9-mm Acer Spin 5 (SP513-52) comes from a small fan, blowing away the heat through the vents, which are located between the hinges. On the bottom of the device, we find the grills for air intake. 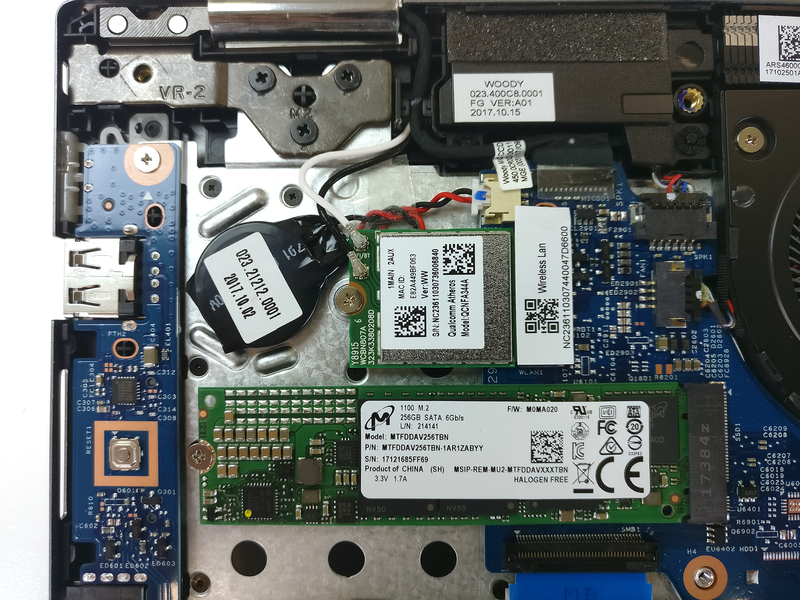 It is pretty easy to disassemble the Acer Spin 5 (SP513-52). In order to get to the internals, you just need to remove the bottom panel of the device. It’s held by 12 Phillips screws. After they’re removed you have to use something to pry the panel open – we used a plastic pry tool. At first sight, we found something disappointing – the RAM chips are soldered onto the motherboard, hence making it impossible to upgrade. Another thing we noticed is the compact size of the motherboard itself. As you can see from the image below, it takes less space than the battery of the device. 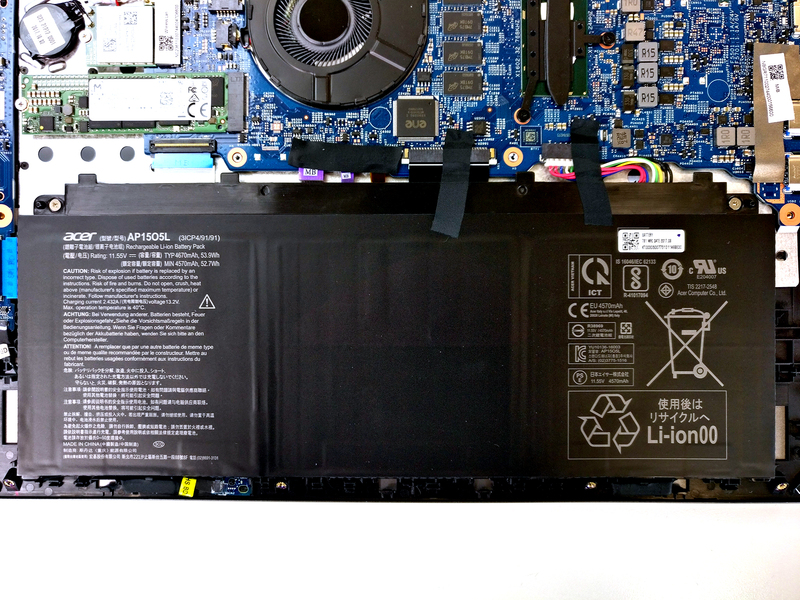 Speaking of battery, on the right you can see the 54 Wh Li-Ion pack. It has a pretty large area, that compensates for the very small thickness. 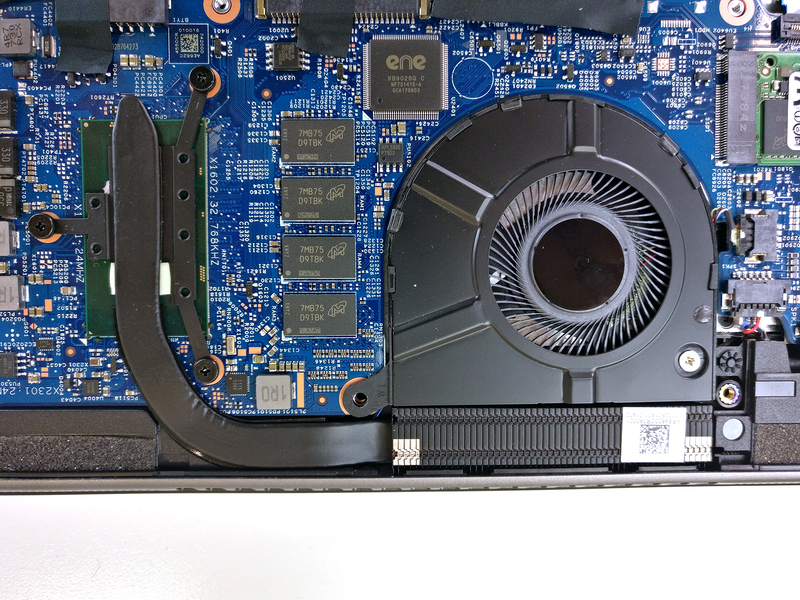 In the left photo, you can see the tiny cooling system placed on top of the Core i7-8550U. One short and fat heat pipe drives away the heat generated from the processor to the ever so microscopic heatsink. Then the heat is dissipated by a fan of a size no larger than a quarter dollar coin. Next, we should mention the storage device here – we only found one M.2 port, which is already taken by the 256 GB SATA SSD device. Right on top of it is located the Wi-Fi card. 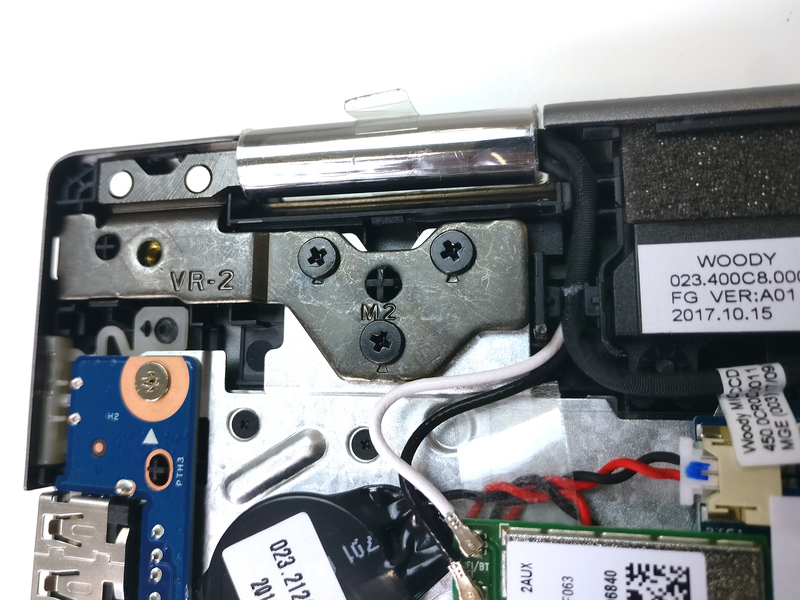 Here you can also see the way the hinge is mounted onto the chassis of the Spin 5 (SP513-52). As you can see, it is held in place by three Phillips screws and has some support elements that go through it. 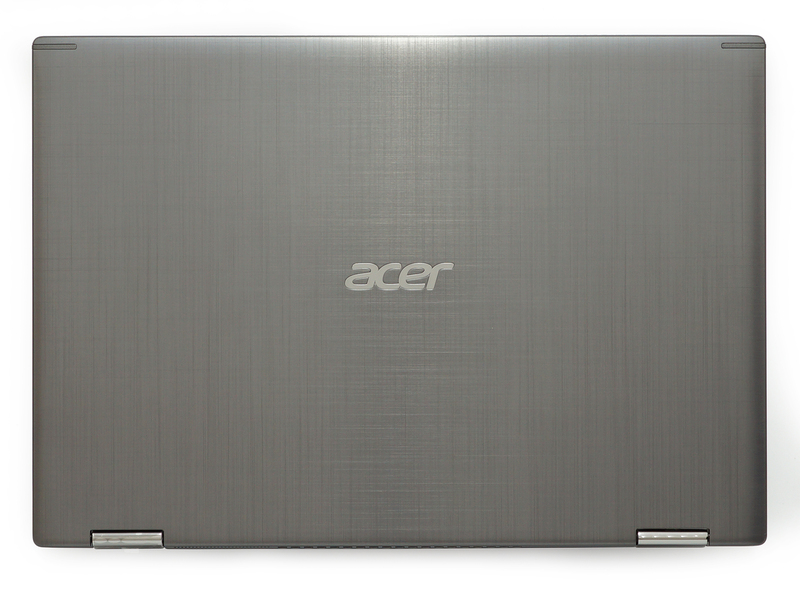 Acer Spin 5 is equipped with a Full HD touch-sensitive IPS panel. It’s made by Landmark and has a model number LM133LF1L02. The 13.3-inch diagonal and 1920 x 1080 resolution translate into a pixel density of 166 ppi and a pitch of 0.153 x 0.153 mm, making the screen “Retina” when viewed from a distance greater than 53 cm, which is a usual distance for looking at a notebook. Typically for an IPS panel, Acer Spin 5 (SP513-52) has comfortable viewing angles. The maximum screen brightness of the panel is good at 294 nits in the middle of the screen and 279 nits, averaged for the whole area. We calculated a maximum deviation of 10% in the lower left corner. At 7070K the Acer Spin 5 (SP513-52) has a bit colder than the optimal color temperature for the sRGB standard (6500K). We also checked the temperature throughout the grey scale and we got a 6980K average before calibration. In the illustration below you can see how much light leaks from the backlight of the panel. We configured our setup at 140 nits which is the most commonly used brightness level. dE2000 values of over 4.0 marks are unacceptable and should not be exceeded. We measured a very good contrast ratio of 1280:1, dropping slightly after calibration to 1240:1. The next image shows the sRGB coverage of Acer Spin 5 (SP513-52)’s display. The color reproduction of the human eye is shown via the “CIE 1976 Uniform Chromaticity Diagram”. In the middle of the dark-grey triangle are located the standard colors used by Internet and digital TV – rec.709/sRGB. Being used by million people around the world the colors from the sRGB gamut are the most common and their accurate reproduction is of key importance for the quality of the screen. In addition to the Adobe RGB color space, used in the professional photography, we’ve included the color gamut used by world-known movie studios – DCI-P3, and UHD-digital television (Rec.2020), which is very hard to achieve by modern displays. We have drawn the Pointer’s Gamut with a black line. This color space covers all the colors we can see around us. 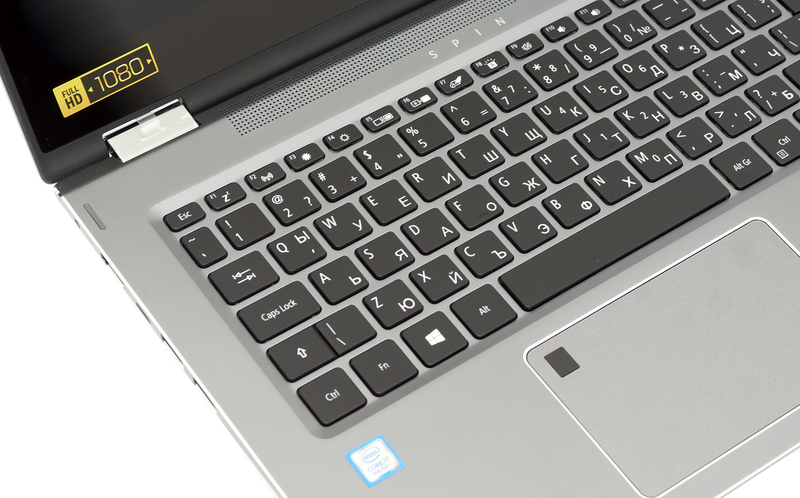 Acer Spin 5 (SP513-52)’s coverage is shown by the yellow pointed line. Its display covers a vast amount of the sRGB gamut at 96% of sRGB/ITU-R BT.709 (web/HDTV standard) in CIE1976. 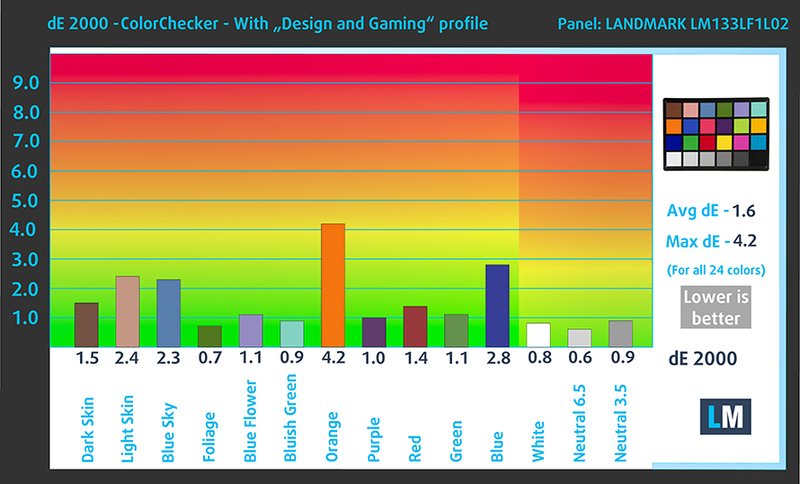 Our “Gaming and Web design” profile is designed to show the optimal color temperature (6500K) when the luminance is at 140 cd/m2 and sRGB gamma. In order to test the display, we’ve used 24 color samples, some of the most commonly found and easy distinguishable ones such as light and dark human skin, blue sky, grassy green and orange. In the charts below you can compare the results of Acer Spin 5 (SP513-52) with the default settings, and with the “Gaming and Web design” profile. The default settings of this panel are very good and are further enhanced by our “Gaming and Web design” profile, providing an average deviation from the real colors of dE under 2.0. The next chart shows us the capabilities for comfortable gaming experience as regards the darkest parts of the image. 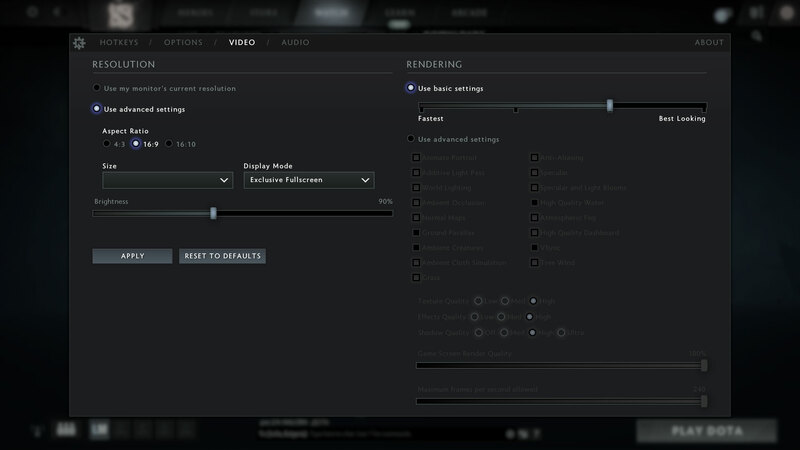 The left side displays the default settings results of the screen, and the right one shows us the results with “Gaming and Web design” profile installed. The horizontal axis gives us the levels of grey, and the vertical one – the screen brightness. You can check how your device displays the first five levels of grey – 1% – 5% White – via the graphics below the charts. The image you see depends on several factors such as the panel of the display you’re currently reading this article on, it’s calibration, your vision, ambient light, viewing angle and more. The diagram below illustrates the response time of the pixels going from Black to White and around for levels of 10% to 90% and vice versa. We’ve measured Fall Time + Rise Time = 37 ms. The panel is not the fastest out there. Pulse-width modulation (PWM) is an easy way to control monitor brightness. When you lower the brightness, the light intensity of the backlight is not lowered, but instead turned off and on by the electronics with a frequency indistinguishable to the human eye. In these light impulses, the light/no-light time ratio varies, while brightness remains unchanged, which is harmful to your eyes. It can be particularly harmful to the eyes and the brain at levels lower than 300 Hz. You can read more about the importance of this issue in our dedicated article on PWM. Acer Spin 5 (SP513-52)’s screen brightness is not PWM-adjusted at levels above 28%, which translates into 76 nits. This means that in the common case, one’s eyes won’t be harmed but if you use it at night and bring the brightness all the way to the minimum you should check out our Health-Guard profile. Acer Spin 5 (SP513-52) showed good results in our screen tests. Its touchscreen panel has good contrast, Full HD resolution, comfortable viewing angles, and comes with adequate default settings, and covers almost all of the colors used on the Internet and HD television. 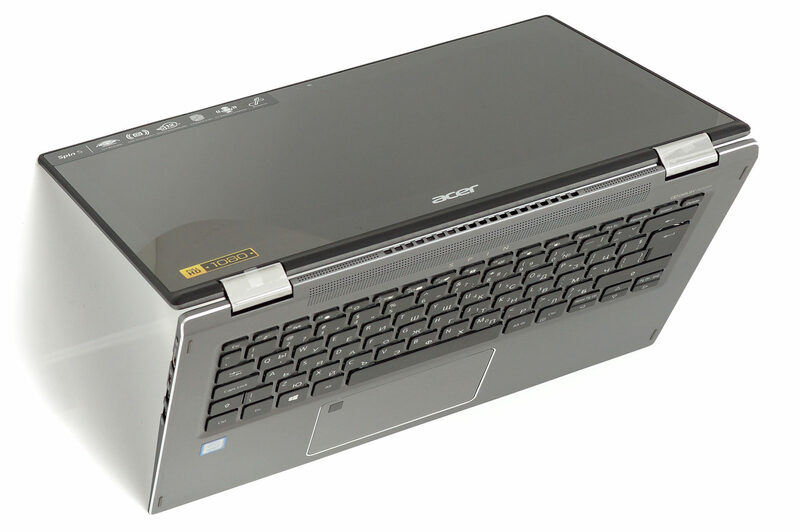 Acer Spin 5 (SP513-52) has a loud and clear stereo sound throughout all frequencies. The operating system preinstalled on the Acer Spin 5 (SP513-52) is Windows 10 Home (64-bit architecture). The screen also supports the Windows Ink technology for a better experience with styluses. If you ever need to reinstall the system, you can get your drivers from HERE. As usual, the battery tests were run with Windows power saving setting and Wi-Fi turned on, as well as screen brightness adjusted to 120 cd/m2. The onboard battery of Acer Spin 5 (SP513-52) is rated at 53.9 Wh which is a fairly good amount of electrons, for this size of a device. Reasonable enough the laptop showed us a very good battery performance – we got 9 hours and 31 minutes of Web surfing time, and 9 hours and 8 minutes of video playback. The only drawback here is the battery life when gaming. Given the low-power nature of the chipset, we expected more than the 2 hours and 2 minutes we got. Anyhow, we doubt that if you actually decide to game on a business laptop, you’re going to do it away from a charger. Here you can see an approximate comparison between the CPUs that can be found in the Acer Spin 5 (SP513-52) models on the market. This way you can decide for yourself which Acer Spin 5 (SP513-52) model is the best bang for your buck. Despite not being a gaming oriented device, Acer Spin 5 (SP513-52) will be able to run some of the most common titles, including Dota 2 and GTA V. Of course, you would need to sacrifice a lot of eye candy in order for the experience to be playable, but still it’s better than nothing. This part of the review is meant to show the capabilities of the storage device. 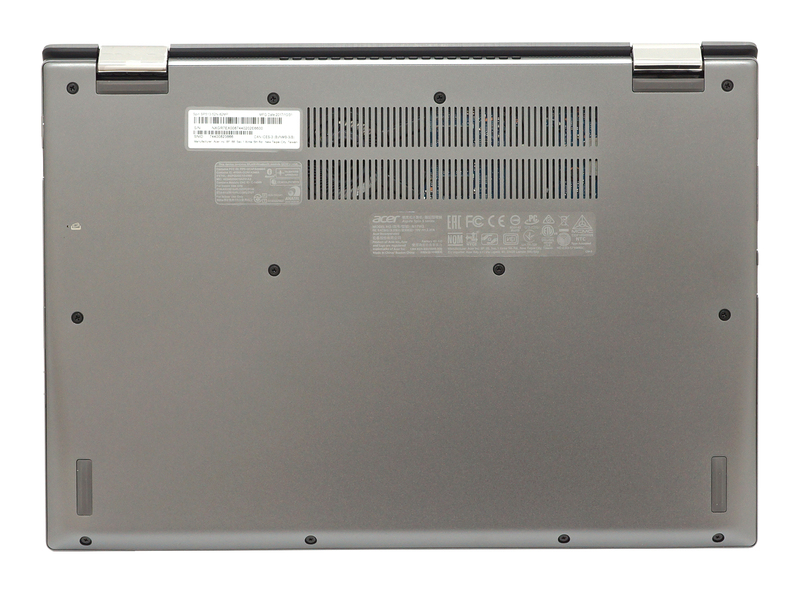 The Acer Spin 5 (SP513-52) we have is equipped with a 256 GB SATA SSD. You may wish to know that the maximum Read speed it reached was 520 MB/s, while the Write speed topped just shy of 500 MB/s. 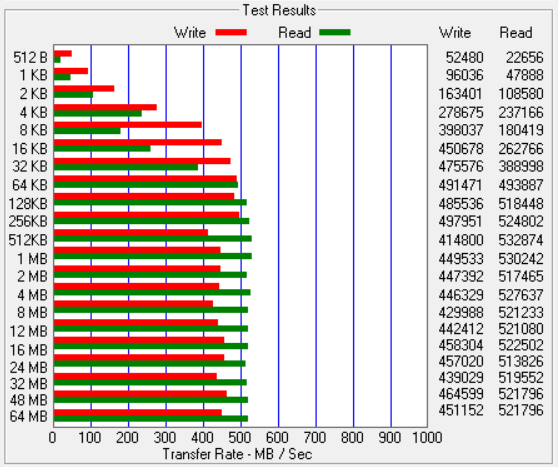 Both of the results are typical for a SATA SSD. The first values from the test are from the 30th second of running the Prime95 stress test, which simulates a heavy task run on your computer (usually lighter tasks take from a part of a second up to a couple of seconds). Next, we take the ones from the 2nd-minute mark, which imitates a very heavy task run by the CPU. The last values we give you are the ones from the end of the test which is 15 minutes, simulating the CPU load when rendering a video, for example. The Core i7-8550U inside this machine was idling at 35°C. 30 seconds after we started the Prime95 torture we got pretty good temperature readings – it topped at 76°C when it aggressively thermal throttled from 3.5 GHz to at around 500 MHz, and this resulted in a temperature drop to 58°C. Despite spending some time at the miserable 500 MHz, the average frequency for the first 30 seconds was 2.8 GHz for two of the cores, and 3.0 GHz for the other two. Moving to the next checkpoint – at the second minute we noticed the pattern to repeat a number of times, which is a strange way to conduct thermal control on a notebook – fluctuating from 500 MHz to 3.5 GHz and resulting in a pretty high average frequency of 2.9 GHz for all cores except the first one, which averaged at 2.4 GHz. Meanwhile, the temperature continued to grow, and then suddenly fell (during the 500 MHz periods) by 20°C, and this time it topped at 85°C. The average at this point was 76.5°C. From the 2nd-minute mark to the end of the test frequencies calmed down and sustained 1.9 GHz for all cores, while the temperature never exceeded 78°C. In conclusion, for this test we should note that the aggressive thermal throttling in the beginning is the main reason for underperforming of the CPU in our CPU tests, but in reality (where tasks don’t take more than a couple of seconds) the Acer Spin 5 (SP513-52) is very capable. The device preserves pretty cool surface temperatures that don’t exceed 30 °C along the greater part of the surface area, so your hands won’t be kissed by the hot lips of the CPU. Another positive feature of this device is the all aluminum design, which feels super sturdy, and has even more weight to it for improved stability. All of that would mean nothing if this convertible laptop had a mediocre battery life. Again Acer’s got your back – you can get more than 9 hours of web surfing and video playback, and while battery life in gaming is not fascinating, we doubt you’re going to play games away from the plug. On the contrary, the capable Core i7-8550U underperforms in our benchmark due to the weird thermal throttling. You don’t see very often a device which pushes the processor from 3.5 GHz down to 500 MHz in an instant. Also, the touchpad is not bad but we surely have seen better on the market, especially at this price point. Our final words for the Acer Spin 5 (SP513-52) would be that it perfectly serves its purpose as a convertible device. We liked how the device performed in tablet mode, and if you are an artsy person, you’ll be pleased with this piece of hardware.